Travel back in time and examine many commonly held myths and half-truths about American history and prompt yourself to think about what really happened in the nation's past - as opposed to what many believe happened. These lectures demonstrate how reconsidering some of the most popular notions of U.S. history can yield new (and sometimes startlingly different) interpretations of political, social, economic, and military events. But more than just debunking commonly accepted accounts, you'll be able to replace these misconceptions with insightful truths. 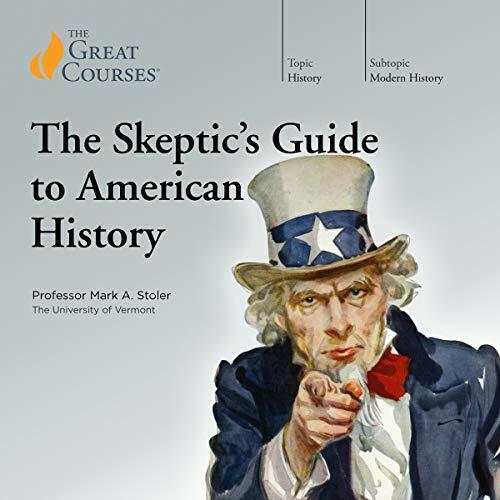 Exploring both America's history and the verdicts that have been rendered about some of its most enduring figures - including George Washington, John Adams, Woodrow Wilson, Franklin Delano Roosevelt, and many others - these lectures investigate a wide-ranging list of questions. What impact did other nations have on the American Revolution? Has George Washington always been revered as president? Do we now understand the true blunders in America's Vietnam policies and tactics? In exploring these and other questions, these lectures prove themselves to be a delightful intellectual experience that will allow you to rethink not just the facts of U.S. history, but also their meaning. I was a little apprehensive about taking this course because of the title. I read many history books, and I get really tired of revisionist history and cynical professors with an axe to grind against America. Given the title, I feared running into exactly this scenario. I was happily relieved to find that not to be the case with this course. The professor's goal is to shed light on American history myths and misunderstandings, but he does so in a respectful way that does not belittle America or ignore the nation's accomplishments. For example, he points out that George Washington lost nearly every battle he fought in the American Revolution, and, thus, Washington was not an unmatched tactical general. The professor points out, though, that Washington was a strategic master who won the war without winning all of the battles by making the British situation in America unsustainable and winning enough key battles to be successful. As another example, he discusses the myth that President Franklin Roosevelt "gave away" Eastern Europe to the Soviets at the end of World War II. The professor explains that the Soviets had already conquered Eastern Europe, and, instead of surrendering territory, Roosevelt negotiated territorial concessions from the Soviets, not vice-versa. The class was fascinating and thought provoking and, thankfully, not cynical or demeaning to America. 120 sur 124 personne(s) ont trouvé cet avis utile. 24 Lectures The American History not taught. This Great Course was very easy to follow and understand. It begins with the causes of the Revolutionary War and goes out to the Vietnam War. I especially enjoyed the parts about the Civil War and the Emancipation Proclamation and the ratings of various Presidents. There was also a lecture on Hoover and whether or not he was helping to get the economy going and what Roosevelt did or didn't do to get us out of the Depression. Lots of things I forgot or never knew, so this was a great learning experience. Professor Mark Stoler is a wonderful teacher and lecturer. I am going to continue to look at some more of these courses as no matter what your age, you should keep on learning. 47 sur 48 personne(s) ont trouvé cet avis utile. How surprised do you think you will be? I think I was hoping to hear some really earth-shaking, recently discovered history. Not so much. For example, I thought my feelings about the Civil War (that it really was about slavery ) would be challenged. But except for some substantial nuances, I was mostly reinforced. The deprivations that the Revolutionary Army suffered through I at least had some knowledge of. The way that the Great Depression lasted until WWII has already been well documented. So even though I self-identify as a skeptic, I thought I would really be challenged. OTOH, it did fill in a lot of holes in my knowledge so I'm happy to have made this purchase. This is an academic class, and one should approach it as such. Mark A. Stoler, while not exciting as a lecturer, was better than my college professors, and made me really interested. There really wasn't that much in his lectures that I didn't already know, but he did clarify things in many instances. And he made clear that, while history doesn't repeat itself, attitudes often are. My boyfriend and I listened to this, one chapter each evening, at dinner, and we paused it often to discuss the material being presented. It beat the heck out of watching TV while we ate, and it actually made the time much more enjoyable than usual, as well as more sociable. I probably wouldn't recommend this as a straight-through listen, but approach it as you would with any history class. The lectures themselves are only about half an hour each, so it is actually easier to take than the usual hour-long lecture one deals with at a college level. And there aren't constant umms and ahhs to irritate. 47 sur 50 personne(s) ont trouvé cet avis utile. This was overall a very good course on American History. What it isn't: A step-by-step timeline of American historical events. It does not tell a story or chronological history as you would expect from most history lessons. It assumes you already know a step above basic American history. For example, it may reference one of the British pre-revolutionary war acts and not explain what that act is. What it is: A detailed look at misconceptions throughout American history. Now IN these misconceptions, we still get a bit of a chronological history. For example again with the Revolutionary War, Stoler details the various reasons of discontent that led to the eventual break, and how the "Americans" reached their final, reluctant ultimatum. Through this lens, he focuses on a very specific misconception and we see the American narrative play out behind it. This course also focuses on the political realm of American history. Pros: Stoler has a great speaking voice. This course is not boring in the least bit, and it is extremely informative. I would also consider Stoler rather objective. I definitely learned a lot and would listen to this course again! Cons: As mentioned, this course assumes some prior good knowledge of American history. If you don't know much about a particular time period, it can be hard to follow as Stoler doesn't always explain the events themselves--he assumes you know what was going on and then debunks misconceptions. There was also a lecture or two that really just melded together because it was a long list of laws passed/political actions. (One lecture in particular about 1800's laws comes to mind.) The only reason I am giving this 4 stars rather than 5 is because a couple of the lectures fell flat. Overall: I definitely recommend this lecture! There were only a small handful of lectures that fell flat, and the rest were fantastic. I'm sure I'll listen to this again down the road. Not everyone's cup of tea but certainly mine. I loved it! It is long as hell, and there were parts I was less interested in, but I really liked the professor's voice and pace, and general outlook. This approach to history is sorely needed, mainly that our view of it is ridiculously colored by the present, and requires a continuously skeptical approach because of this. The naysayers reviewing it were hoping for more/expecting something different from the word "skeptic" in the title, so read their reviews, but I didn't expect anything more than some observations by a guy who studies these things, not a debunking of every myth ever. So I was happy. Also his voice. I have abandoned perfectly good books because I hate the narration. They all seem to come from the same farm that trains people to say that xyz drug "may not be right for everyone; symptoms may include vomiting, diarrhea, shortness of breath, suicidal ideation and hallucinations" etc. in the most mellifluous Stepford Wife voice possible. Those people need to GO. You do know all that stuff you learned about American history in school was simplified, right? And, in a certain sense, it was propaganda: a narrative intended, in this case, to give young people the feeling that they are heirs to a righteous cause, whether we were opponents of tyranny, barbaric natives, evil slave-owners, socialists, or you-name-it. We were always on the right side of history and history can be understood as an epic struggle between we good people and our evil enemies. We don't necessarily bring any new knowledge when we draw these conclusions, but when they seem to match our beliefs about the world, we assume they must be accurate. Those mistaken conclusions (and assumptions) become difficult to let go of, even when we are presented with new opinions of working historians who find new, compelling information that contradicts us. This lecture series is for adults who are ready to let go of the storybook history in exchange for a more complex, nuanced understanding of history. I loved this lecture series. I looked forward to the next time I could sit down and listen to one of them. Each one was full of the context I needed to understand why what I had always believed about American history may not actually be what historians, with the fullness of time, have come to believe about it. I also found the Professor's presentation enthusiastic and easy to follow. Excellent lecture series all around. 62 sur 69 personne(s) ont trouvé cet avis utile. This is how history should be taught -- not with presumption of knowledge, but with more questions and the attempt to answer such questions with all available data currently known, while still acknowledging that much still needs to be learned. Also a relief to not hear how "good/bad" events or figures were in general, as if such subjectivity can be written as fact. Rather different perspectives were approached, and what was "good/bad" for whom, from which perspective, and in consideration of which goals/intentions. I thought I would be hearing a more cynical presentation and was pleasantly surprised to find that was not the case. One of the best presentations of events and facts supporting the lecturer's interpretation of those events I have ever heard. My first experience with the world of &quot;The Great Courses&quot; and I'm glad I took a chance. The professor seems to know his subject well. I'm a fair student of American history so some of it wasn't surprising to me. I appreciated having the PDF to help my comprehension of subjects with which I was less familiar. It just so happens that I have some books around the house that are recommended reading. Guess I have to move them closer to the top of my TBR pile!